I've been alluding to my travels through Western Europe and Vietnam throughout all my blog posts. Here is a photographic journey, for those visually stimulated foodies who, like me, love looking at food photography (foodography?!). Here is my first post in my International Foodography Special about the first leg of our culinary adventure - Spain and England! Next issue will be on Amsterdam & France, so stay tuned! Ola, Spain! Spain was our first stop on our five-week backpacking adventure that would take us through most of Western Europe and Italy. It was all about beaches, Mojitos, and experiencing the fun-loving, party-going night-owls that comprise the Spanish population. Barcelona, which is the European version of the city that never sleeps, was one of our most anticipated destinations. For the first few lunches in Barcelona, we were usually the only diners at restaurants. Strange, we thought, until we found out that lunchtime in Barcelona wasn't until 2PM and prime dinner time didn't kick in until at least 8PM. With our stomach clocks still stuck on North American hours, we never had trouble finding a table in Barcelona. None of us knew much about Spanish cuisine; the closest thing we could compare it to was Mexican food.. They both speak the same language...but shared little, if any, culinary and cultural similarities. Tapas are small-medium, sharable snacks or appetizers often served in bars or special tapas bar/restaurants. Very traditional for Spain. For foodies, these are the perfect finger foods - you can try a variety of different tapas and almost never get full off the bite-sized delights. On our first night in Barcelona, my companion and I got lost from the rest of our crew and wound up at a franchise tapas restaurant. Accidental European date night, perhaps? MISS! (Right) Cream cheese, smoked salmon, baby eel and caviar on a toasted baguette. A traditional tapas dish from a tapas bar in Barelona, Spain. Honestly, it wasn't my favourite dish in the world, and those baby eels sure make you squirm when they go down. HIT! (Center) Smoked prosciutto on scrambled egg and a toasted baguette and MISS! (Left/Right) the Spanish version of a grilled cheese sandwich at a tapas bar in Barcelona, Spain. Smoked proscuitto are definitely one of my favourite things in the world had this one had a nice smokey, salty taste to it which offset the heaviness of the egg. The grilled cheese were a little plain, and I definitely prefer the North American processed-cheese version. MISS! (Center) Calamari served with mayonnaise on a toasted baguette and HIT! (Right/Left) Fried-cod fish ball served with mayonnaise on a toasted baguette. The calamari were not nearly fried enough and were a little under seasoned and plain (this was true of calamari almost all around Spain). However, the fried-cod fish ball were bursting with flavour and probably my favourite of the night. Too many carbs at this "trendier" tapas bar on Las Ramblas strip and I would have preferred the tapas without all the toasted baguettes. The other half of our crew ended up at a more "local" tapas bar with big portions and much less "groomed" service. They did say the patatas bravas, a traditional Spanish dish consisting of fried cubes of white potatoes covered in spicy tomato or mayonnaise sauce, was one of the best potato dishes they had ever had. Sometimes it's better to do like the locals I guess! Onwards and upwards to our second stop in Spain - Madrid! Madrid is the official capital of Spain: typical well-groomed government city with its equally well-groomed and well-mannered citizens. Definitely less wild than its rebellious sister city Barcelona. If I could compare cities, it would be like Ottawa and Toronto, for those of you who have visited the two Canadian cities. Even though Ottawa is the very beautiful and groomed capital of the country, Toronto is just where all the happenings are at (Madrid being Ottawa and Toronto being Barcelona, if you guys didn't get that). With Madrid, came the discovery of Paella, a traditional Spanish rice dish which is made by almost stewing the rice with vegetables and traditionally rabbit, chicken, duck, or various sea foods. The best paella we had in Spain was a rabbit-tomato-stewed paella. However, most Spanish restaurants serve the seafood variety - which typically consisted of mussels, crayfish, calamari, and shrimp - which was a lot heavier, saltier, and completely HIT or MISS at a lot of restaurants. A "Farmer's Market" in Spain is something you really shouldn't miss. We found ourselves at the famous/touristy marketplace in Madrid drooling over some of the local foods. HIT! (Right) Salmon Ceviche served on a fried piece of bread. Ceviche is Spanish dish consisting of raw fish marinated in citrus juice and spiced with aji or chilli peppers, chopped onions, salt and coriander. The ceviche we tried at the market was bursting with flavour and oh-so-delicious! Another excellent dish we tried there was an ox slider, yum! Madrid has this awesome all-you-can-eat tapas bar called Le Tigre. It serves AYCE tapas and literally 1L of beer or Mojitos (your choice!) for €6! Worth it just for the drinks! Spain is often a forgotten culinary power. When we go out for "European" food, we almost invariably end up at a classic French or Italian restaurant, or occasionally a British-themed pub. However, if there's a tapas restaurant that happens to specialize in ceviche opening near you, be sure to check it out and discover some of Spain's culinary gems! Also, when in Spain, don't forget to visit the Sagrada Familia - you may not be able to eat it, but it was one of the most breathtaking structures in Spain and one of my all-time-favourite architectural masterpieces. London, England! - home of the Queen, Paul McCarney, and most importantly - Harry Potter! From Madrid, we took a thirteen-hour overnight "sleeper" train to Paris, then a two-hour underwater (let me repeat, underwater!) express train from Paris to London. We were tired and starving: our Editor in Chief, Shannon had only a baguette and some spoiled speck ham to sustain her on the train ride (apparently, that is what happens to ham when you carry it around for six hours in your 30 lbs travel rucksack beneath the blazing Spanish sun...). For both our sakes, I won't include the picture of us all pawing at the spoiled ham and baguette on the train like a pack of wild train drifters. Needless to say, we were all glad to reach Shakespeare's country. Other than Petrus, which actually specializes in French cuisine, we were able to try some of the traditional Brit favourites. HIT! 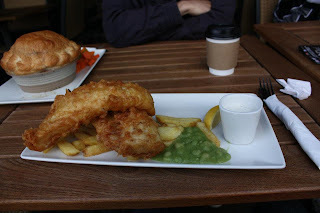 (Right) Fish and Chips served with mashed peas and tartar sauce. One of my all-time North American fried favourites. As a kid, I remember many occasions where my mother would pack me Birds Eye Fish & Chips and I loved them! But boy, you've never tasted fish and chips until you've tasted it the way the Brits make it: the cod was fried to perfection leaving the center soft and moist. The batter is what really seals the deal - it crisps up delightfully, and does not leave any oily residue to spoil your meal. HIT! 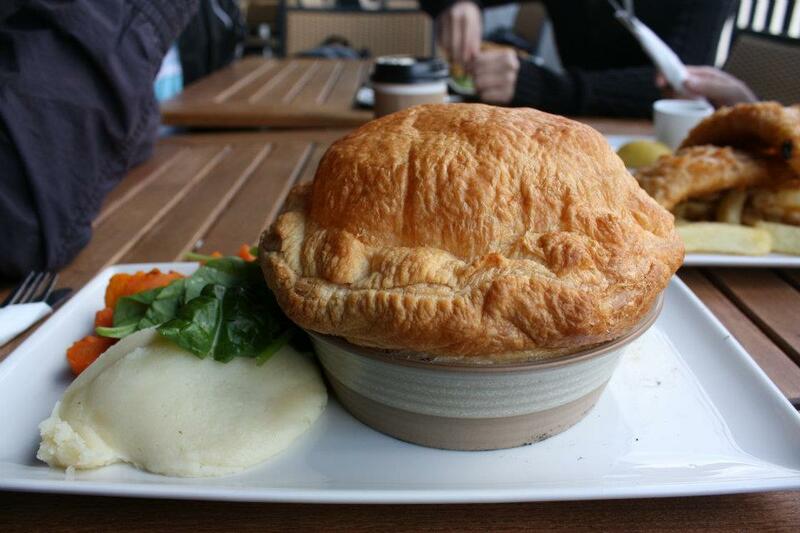 (Left) Chicken Pot Pie with mashed potatoes and steamed carrots. Even the most sophisticated foodies among us has succumbed to those chicken/beef/turkey pot pie TV dinners, at least once in our lives (if you haven't, you really must try it sometime - they're not all that bad!). Just by the picture, you can tell there is a startling difference between the pie crust and top than any you've seen on your TV dinner tray. The Brits make the pie crust and top is exquisitely flaky, almost French-pastry like, and the pie crust simply melts into the gravy (and your mouth!) as you dig through the pie. The gravy is so well-seasoned, full of brothy chicken flavour, but exceptionally light. I wish they made TV dinner pies like this one! MISS! (Left) Bangers and Mash. Bangers and Mash are a very typical British dish consisting of either beef, pork, or Cumberland sausage served with mashed potatoes and onion gravy. The sausages were well cooked, but nothing extraordinary. In fact, they were a little on the dry and salty side which the onion gravy could not quite save. 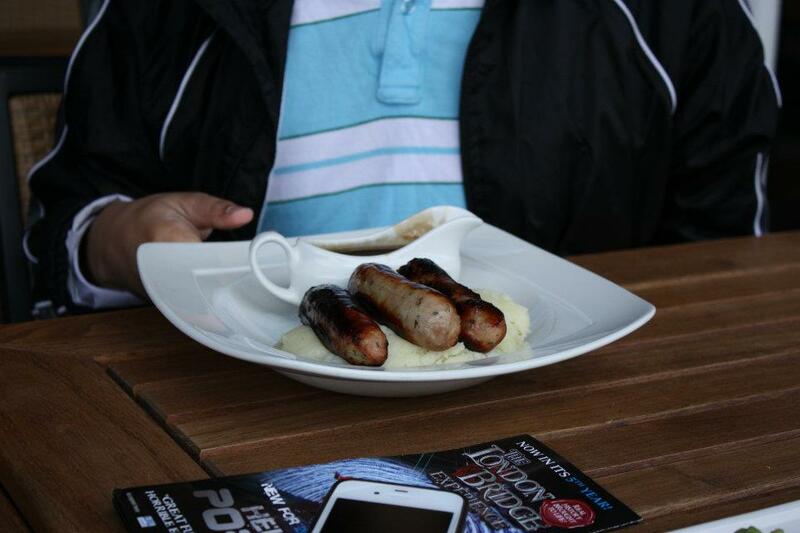 The part I disliked most about Bangers and Mash as a dish, however, is how heavy it is! - It sort of just sits in your stomach waiting very patiently for its turn to be digested. MISS! (Right) Burger and Fries. Eh...what's really different between a British burger and any other burger in North America. Except that AAA Alberta beef I find a lot more juicy, tender, and flavourful than the cow variety they farm in Britain. All in all, pretty average and nothing special. London was a fun little stop even though we missed the Olympic frenzy (though in retrospect, this was probably for the better). It was a lot colder than it was back home in Ottawa (I think Britain and perhaps Paris were the only two places where I actually required my jacket), but even so, we ventured to all the big sites in Britain including Big Ben, Buckingham Palace, and London Eye (both of which you can see in the banner). The Crown Jewels were an incredible historical piece to view, so don't miss that when you're in Britain. Other than that, however, Britain felt much too similar to home and was a lot less exciting that I had imagined. 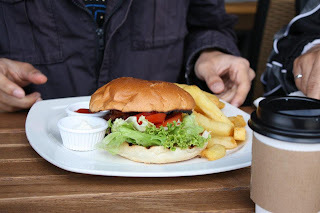 Food wise, London has very similar foods to Canada (though, they do it with a much more interesting British flair) and some of its dishes tend to sit quite heavily in the stomach. Although less well-known, I prefer Spanish cuisine - with its finesse little dishes like ceviche and tapas - over the British cuisine.